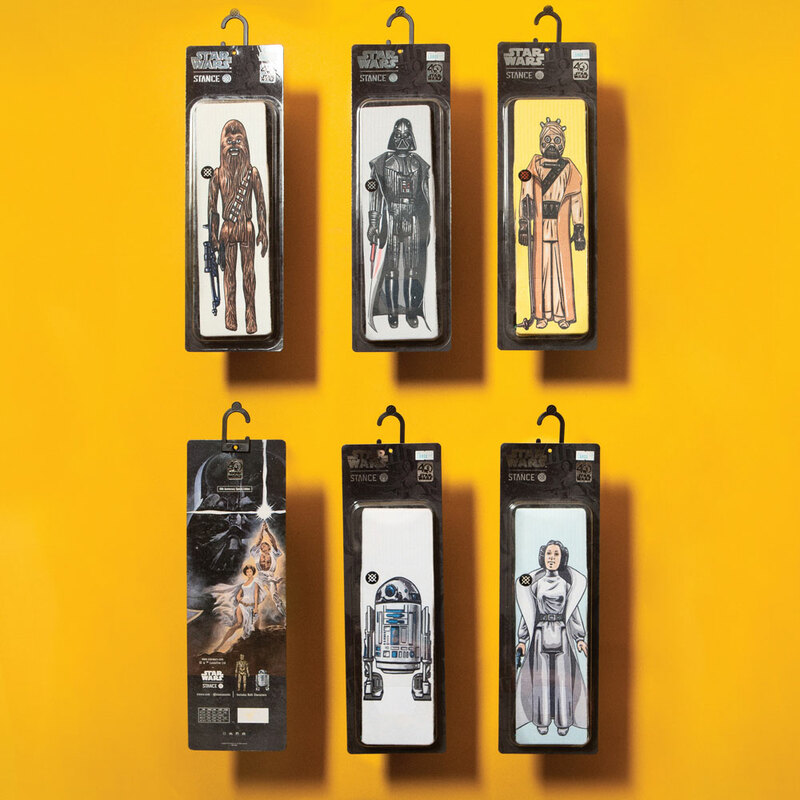 How Stance wove Kenner toy-inspired art into socks to celebrate Star Wars' 40th anniversary. Quick: what do basketball player Klay Thompson, Dwayne “The Rock” Johnson, and Canadian Prime Minister Justin Trudeau have in common? You might be surprised that despite their incredibly different occupations, they share a love of Star Wars socks from a company called Stance. 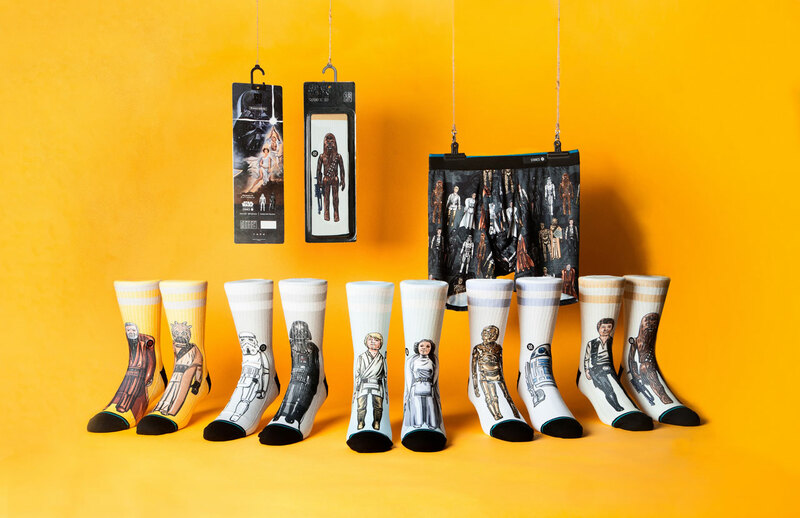 Stance started making Star Wars socks back in 2015, ahead of the release of The Force Awakens, steadily rolling out more styles for each new film. Stance’s latest collection is for the 40th anniversary of Star Wars, featuring images of your favorite characters, but with a vintage Kenner action-figure twist. They’re fashionable, are a creative way to honor this milestone, and will make your sock drawer more powerful than you can possibly imagine. 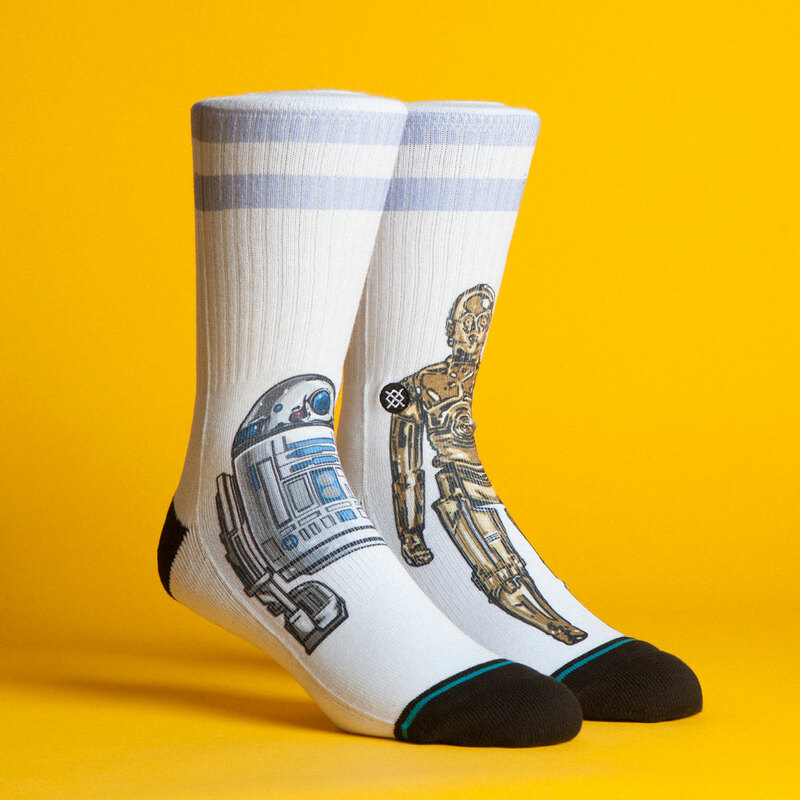 But what’s it like to design and release Star Wars socks? 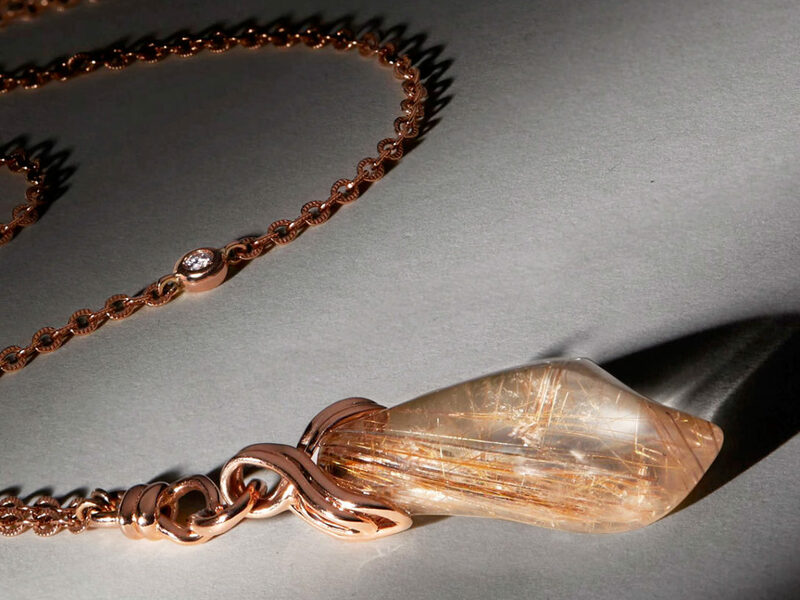 StarWars.com chatted with Joe Jorgensen and Ryan Quinn, VP of design and director of merchandising, respectively, about bringing these wearable pieces of the saga to life. 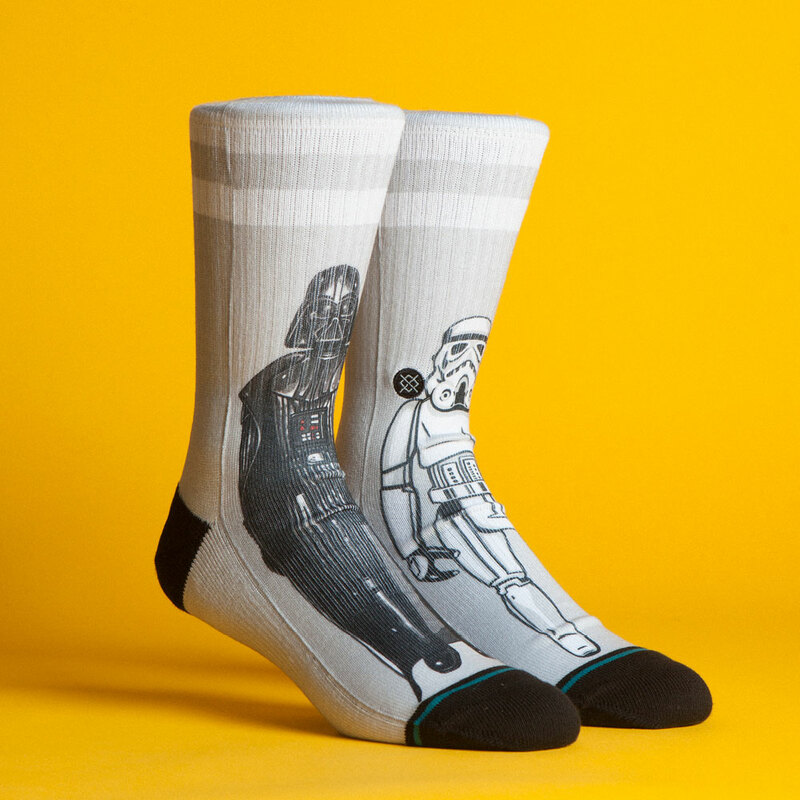 StarWars.com: Stance has been in the sock business for a while now. You’ve designed sports-inspired socks and even Evel Knievel socks. 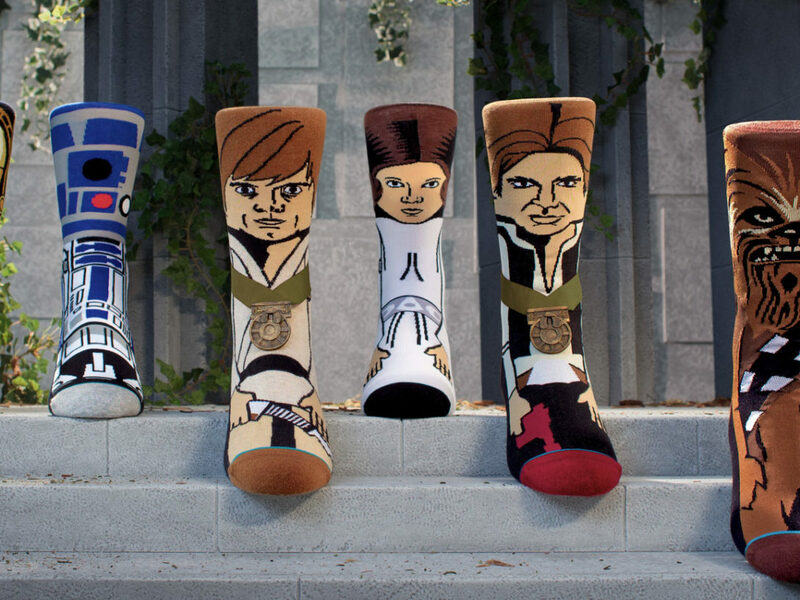 What made you want to make Star Wars socks? Joe Jorgensen: The way that all of our projects come about is through a natural connection to someone in the building. I grew up as a fan, and I have a son who is a huge, huge Star Wars fan. A couple of years ago when The Force Awakens was announced and we started to realize what was going to happen as [Star Wars] was reintroduced to a whole new generation of kids. There’s also a part of it that fits our brand. 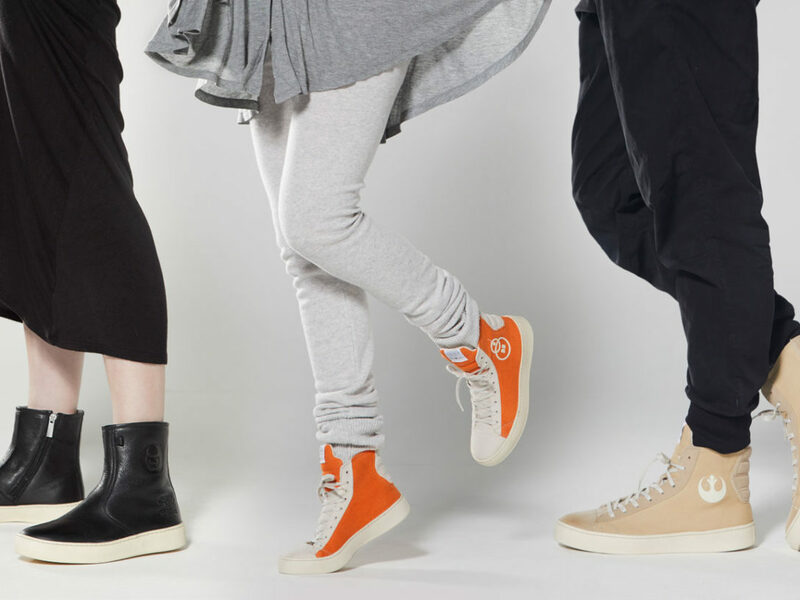 We have a mantra…we say that Stance exists to celebrate human originality. That’s kind of a big idea to live up to, but if you look at what Star Wars represents not only from a storytelling point of view, but also a visual and creative point of view, [it fits]. 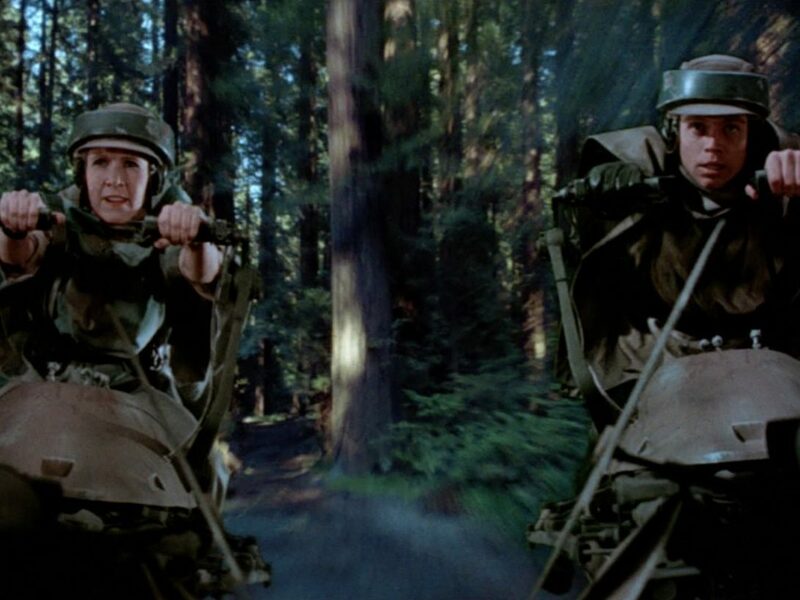 There aren’t many other franchises in media that celebrate originality more than Star Wars does. 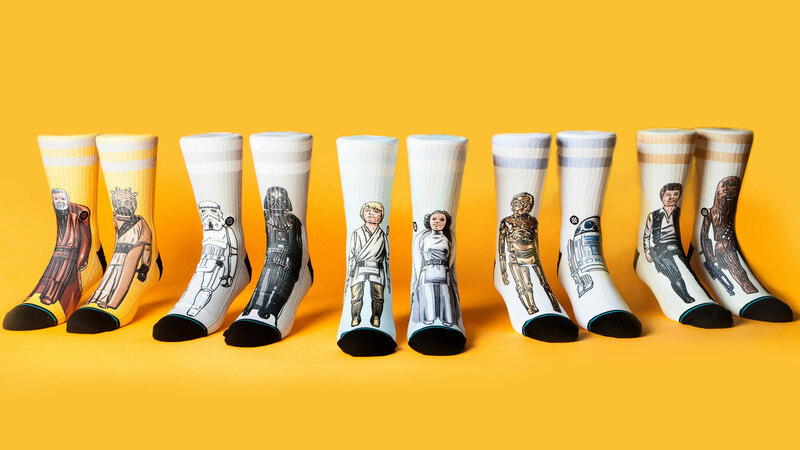 StarWars.com: For the 40th anniversary, you’ve rolled out unbelievably cool socks with vintage 1977 action figures on the front. When planning for this milestone, what kind of socks did you have in mind? Joe Jorgensen: We were invited to participate in this…we love our relationship with the team at Lucasfilm. There are some awesome people we work with up there. We honestly didn’t realize there was going to be such a special opportunity. [We were inspired by] all the merch and the toys that we grew up with. So we dug in just looking at what we had…those were some fun Google searches. Like “I remember I had that!” or “I wanted that but my mom would never buy it for me!” and so we got into that and found this connection to the nostalgic action figure thing. We were ultimately able to work with a great illustrator who took the still images Lucasfilm provided us and re-illustrate the action figures. And we rolled that all the way through the packaging before we brought it to market. 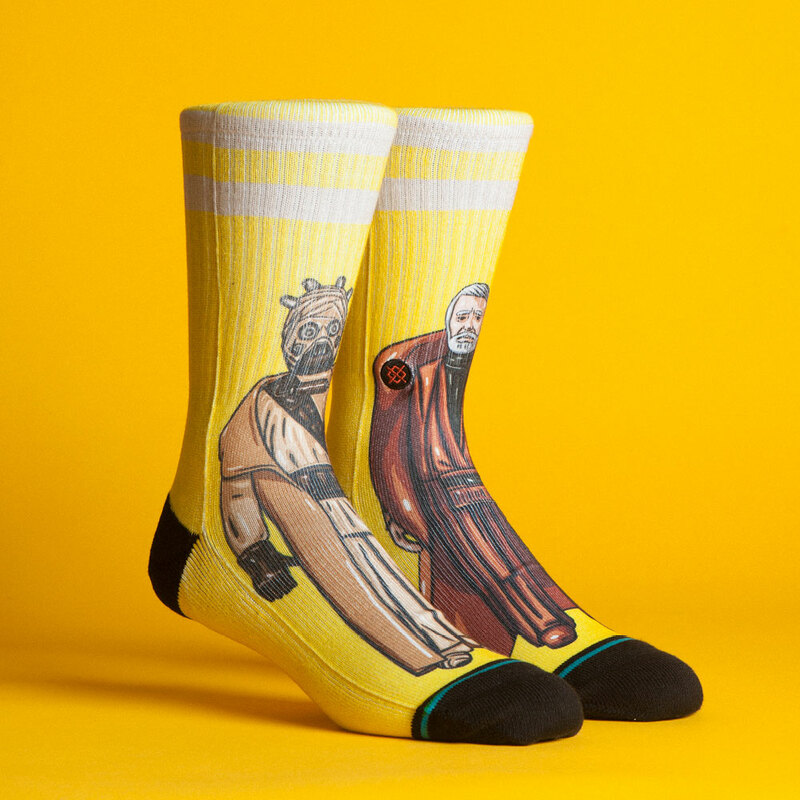 StarWars.com: Many of your pairs of socks feature mis-matched characters. How do you decide which characters go together the best? Ryan Quinn: Ever since day one, we’ve done mis-matched socks. This was the largest, most mainstream partnership we had at this point. 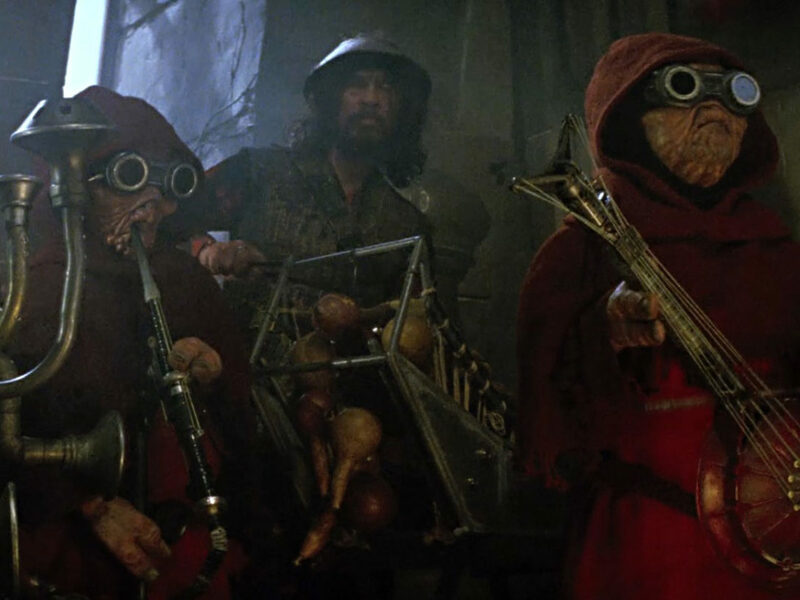 So, we tried to put those best elements of Stance with the best elements of Star Wars. We felt like that was one of the coolest pieces that Star Wars had: the clash of good and evil, and the relationships between the characters. When we first met with the Star Wars team, that was one of the first things we came up with as a group. Joe Jorgensen: It was interesting in the beginning, but that was one of the hardest things to do. We can say okay, we’re going to pair all the dark side guys together, but also you can pair rivals and do it that way. It’s like, who do you pair Darth Vader with? Do you pair him with Luke, do you pair him with a stormtrooper? We had so many socks designed and to whittle it down to 13 was really hard to do. One of the examples is that we paired Han Solo with Chewbacca. Like, you have to do that, right? But it came up in the conversation that it’d be really cool to pair Han Solo with Greedo, too. 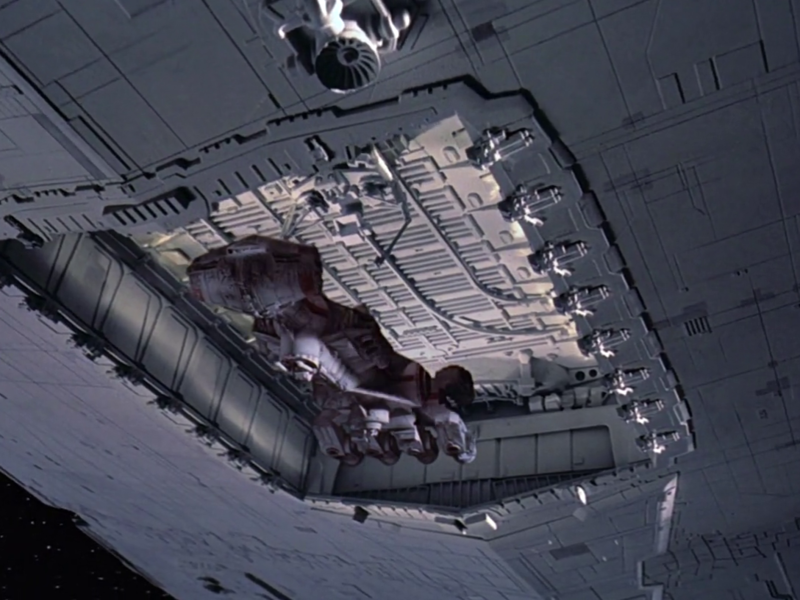 That’s a great Star Wars moment, right? But Chewie’s mainstream and it’ll resonate with more people and so Greedo went on the floor and we never totally gave up on that idea. In the big gift box we did with our first characters, we created a fake floor in the bottom of the box and we were able to sneak Greedo in there…there may be people who don’t even know they have [Greedo], that’s how well hidden they are! We know how much it resonates with the fans when you can acknowledge a character but you can pair it with another person you can acknowledge a whole storyline. 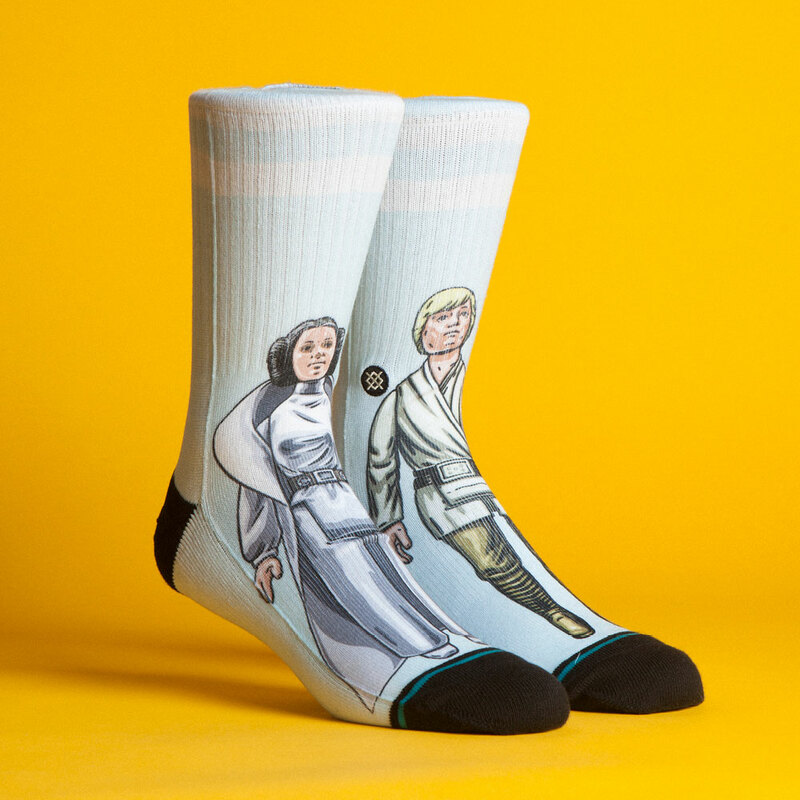 StarWars.com: Was there something that surprised you about making this series of socks? Speaking specifically on the 40th anniversary project…we got all the photos of all those action figures in. It was surprising to me how difficult it was to get the illustrations to look like the character they’re supposed to be, but also look like the actual action figure. It’s a fine line, because they were plastic molded toys from the ’70s so they didn’t have the modern CAD technology to get the features and proportions right. So we had to tread that line, and that took a few different rounds of design. StarWars.com: Many of your Star Wars socks feature a distinct character design. What inspired the look of these socks? Joe Jorgensen: I think when we started, we were sent some style guides and some imagery. 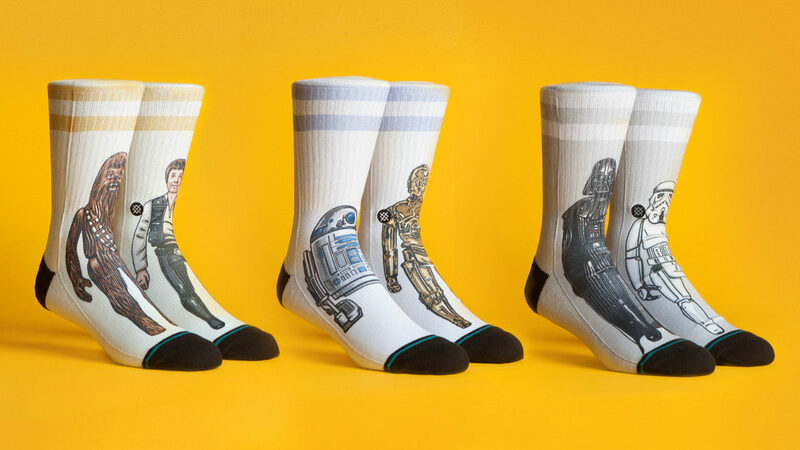 So we started throwing images on socks, and we did some research to see the other Star Wars socks that were out there. But this whole thing is about the characters, so it’s gotta be characters and their stories. At the same time, we were working on our NBA socks. The idea of turning the sock into the persona had been kicked around. 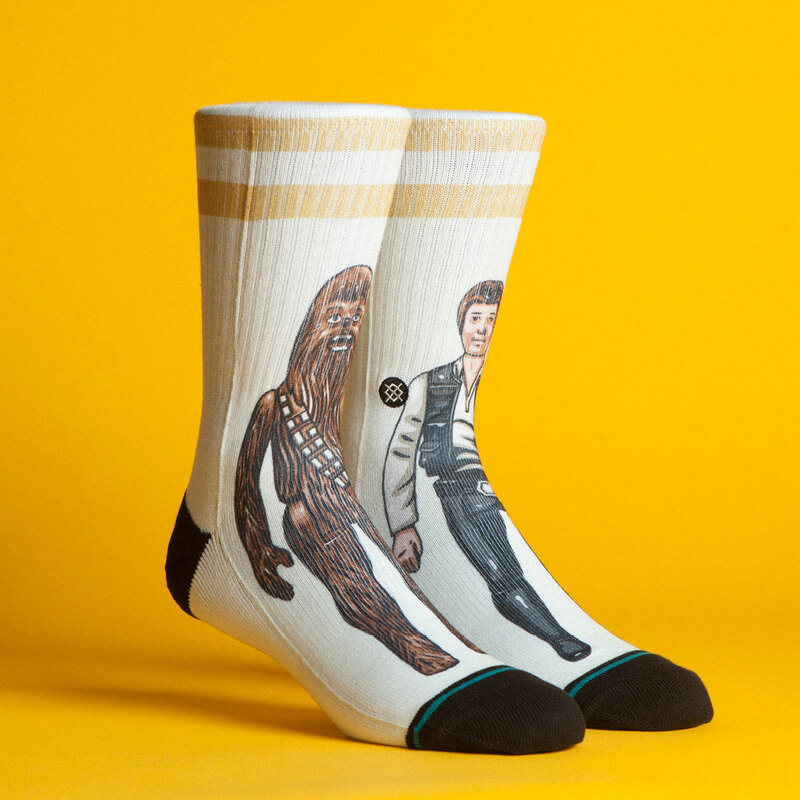 Our Big Daddy Kane [socks] hadn’t gone to market but we thought to run it as a formula with Star Wars. So we did a couple obvious ones first. We [decided] we needed a Stormtrooper and Darth Vader. 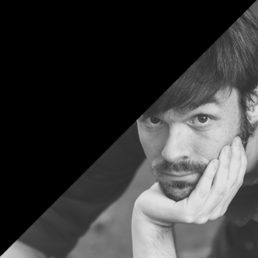 Ryan Quinn: I feel like our filter is that we’re very lighthearted. If you can chuckle or laugh and see the humor or cool creativity in it, that passes. StarWars.com: When you pick a character or theme for a sock, what is the design process like? Joe Jorgensen: When we go through our character selection process, we’re highly collaborative with Lucasfilm. They know what resonates with fans. We work with them on a brief that fleshes things out. I have a file somewhere that must have 70 different sock designs in it. We went pretty wide when we were originally exploring it. Our formula is a long rectangle [shape], so certain characters are pretty tricky to fit. We also look at breaking down key things from that character or the storyline and including Easter eggs that customers are going to like. So, we have to make sure that if it’s a Jedi character, that the lightsaber is right…it’s the right handle, it’s the right color, it’s from the right film. I remember realizing early on how specific and how detail-oriented we had to be. Then it’s just bringing out all the great things that we remember about these characters. It’s so fun to get to click around on [pictures of] Boba Fett’s helmet and make sure that you’ve got all the shapes and proportions right. You feel like you’re part of this thing that’s bigger than life. StarWars.com: Which Star Wars sock design do you love to wear the most? Joe Jorgensen: I’m pretty partial to the Boba Fett/Han Solo in Carbonite pair. And then, I love the Greedo sock we did just because it had brighter colors. It just really popped for whatever reason. 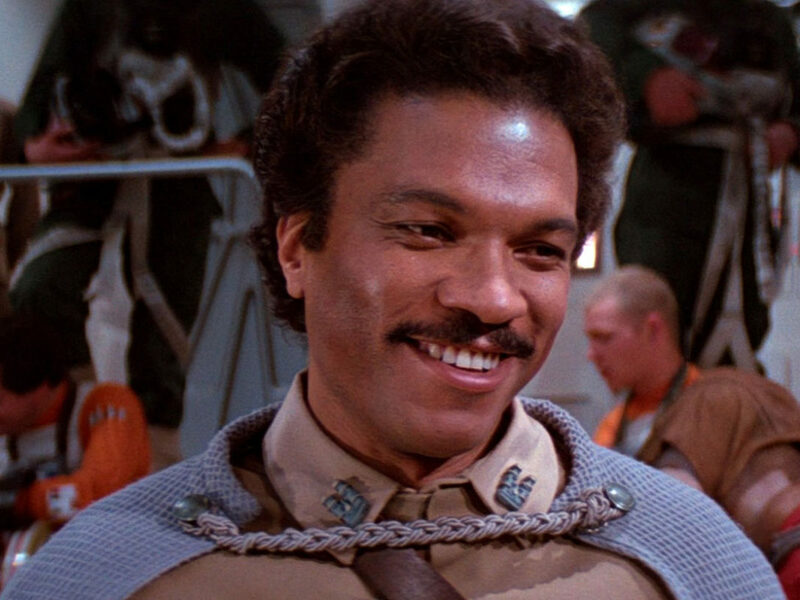 That first collection, you’ve got a lot of black and white, brown and tan [characters]…so that Greedo was just so much brighter and it’s also because so few people have those. StarWars.com: Are there future sock plans you can share? Joe Jorgensen: We try to line up our collection drops with the big film releases, so we’ve got something coming for this holiday. It’ll incorporate a little bit of classic and a little bit of new. We’ve also got a really exciting thing happening this summer at Comic-Con where we’re doing some limited-edition stuff. We took a little more license with color and worked off those great, successful characters. We’re also expanding Star Wars into the underwear category, we’ll be working with some illustrators on that. And we have a specific women’s collection coming, as well. Brendan Nystedt was very afraid of Darth Vader hiding under his bed when he was five years old. Now, he writes reviews of consumer electronics for Reviewed.com. Please follow him on Twitter @bnystedt!